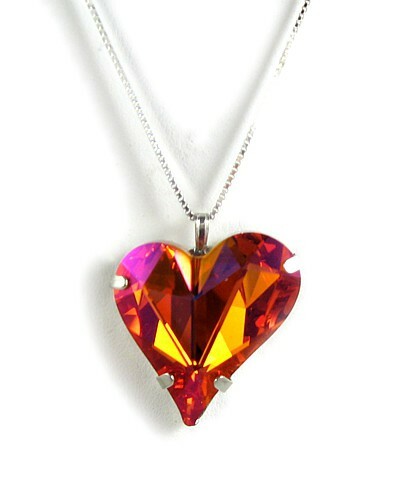 The most outrageous of the three Dali Sweetheart necklaces, this exquisite orangey pink version is one of the new colour crystals from the Swarovski Company in Austria. Designed to make you stand out from the crowd, this brilliant contemporary-shaped Dali heart necklace looks divine with virtually any outfit, from LBD to jeans. Perfect in size to make a statement, yet small enough to be classy, this necklace looks perfect when you're dressing up, but can easily be worn to the office, too. Comes complete with a Sterling Silver Mirror Box chain. Size: 3cm x 2.5cm. 41cm or 46cm Sterling Silver chain with 4.5cm extension.